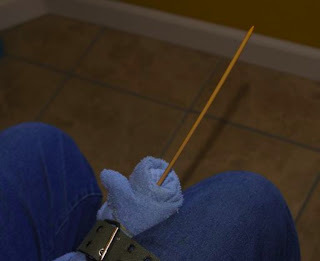 Knitting One Handed. : Set up for one handed knitting. Set up for One hand knitting. I want to thank Kathy Joy for allowing me to enter the world of one hand knitting with her. These directions are for someone who has never knitted. Some of this may be new some old. 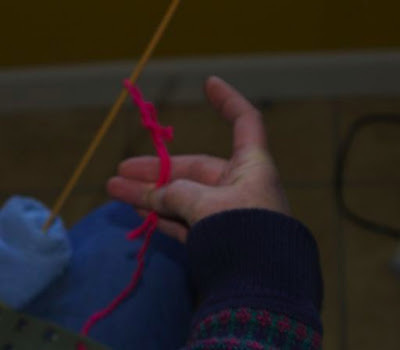 The photos are from the view point of the knitter looking at her or his hand. These directions are above all a place to start, as I am me, and you are you, what works for me may not work for you. The materials I use I found at home or at a second hand store. There are other options that may work better for you. I chose these materials because the cost is low and may get you knitting for the lowest cost possible. For the other options check out knitting belt and knitting sheaths sources on the Internet. Knitting belts and sheath have been in use by knitters since way before my time though they will cost a bit more than my towel and multi hole belt. As I am a right handed knitter, you will see that I am using my right hand. If you are left handed hopefully your computer will be able to make mirror images of these photos. My directions do not use left or right hand so hopefully the words will help and the photos guide. I want to thank my oldest daughter Aleta for taking the photos for these one handed knitting posts. Long straight knitting needles with small "button at the end to keep stitches from falling off. The needles shown here are, I think about size 6 or 7, US. Fold the towel in half and roll up as tight as you are able and put rubber bands around the ends. One end of the roll will show the rolled folded edge, the other the edges of the towel. With the folded end up, secure the towel to your leg with the belt. Stick the button end of the knitting needle into the center of the towel, until only half of the knitting needle is sticking out of the towel. This should hold this needle, I will call the holding needle, almost still. Take the yarn and pull about two yards from the skein or ball. Place the ball or skein on the floor. Feed the end of the yarn through another hole on the belt. This will help control the yarn. 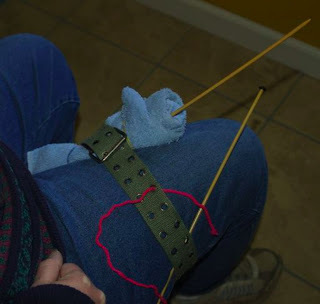 I found that the belt is also a quick way to hold the other needle that I will call the working needle because it is the one that you will use to manipulate the yarn as you knit. 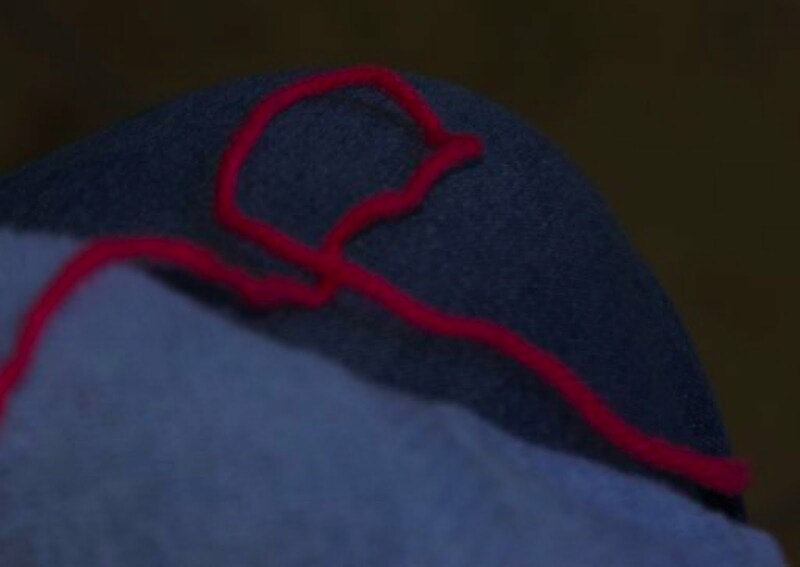 The holding needle will hold stitches. As you threaded the end through the belt hole you will see that you have a short tail that includes the end of the yarn, and the part of the yarn attached to the skein, which I'll call the long tail. Here you see the short tail nearest my knee. 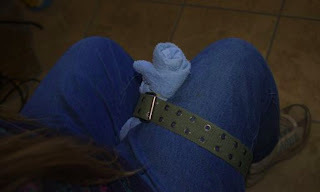 You will be pulling the yarn to the knee side of the belt to use it. The long tail will always be the part of the yarn that will lead back to the skein. 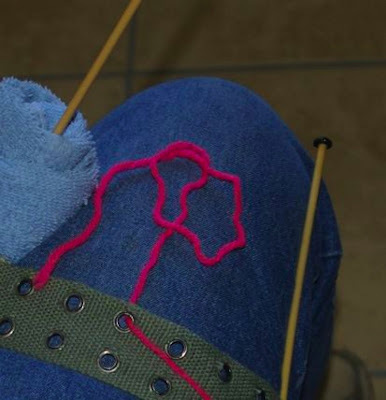 Now we need to place the first row of stitches on the holding needle, called casting on. 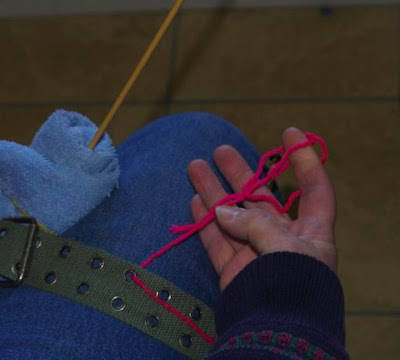 The way I'm going to teach you to cast on is called the knitting cast on. This is my favorite way to cast on stitches. 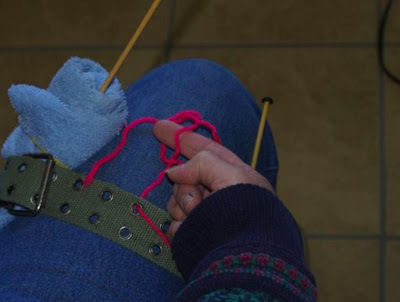 I believe it allows you to put a loose but stable stitch on the holding needle. Which I think is important for one hand knitting. There are many ways to cast on. I do not know how to do all of them but you can find this info on the internet or from your local knitting store or knitting group. One of these other ways may be easer for you. The main thing to remember in knitting is that you are creating a loop and then pulling that loop through an existing loop. Now we need to make a slip knot which is our first loop. Make a loop with the yarn so that the short tail lays on top of the long tail. Pick up the top of the loop and fold it over so that the long tail is under the loop and divides the loop in half. Now you will take hold of the long tail that divides the loop in half and pull it up to make a new loop. This new loop you will put on the holding needle that is stuck in the towel. Now you can pull on the long tail to tighten or loosen this stitch. Cast on Second Stitch, One Hand Knitting.